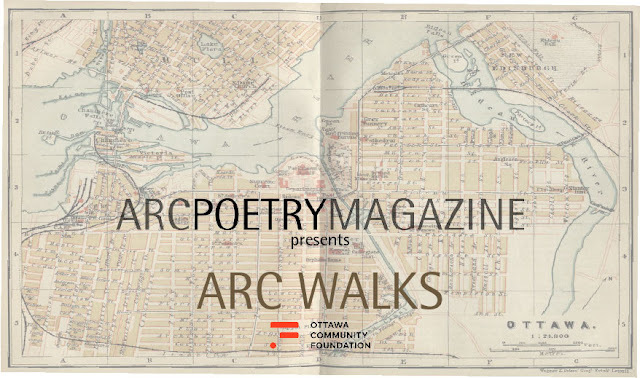 Arc Walks Ottawa is a series of guided walks based on poetry themes and capitalizing on the rich poetry history of Canada’s capital. Residents and visitors alike are welcome to join in on the walks to learn and revel in Ottawa’s poetry. The sixth and final walk of this series will take place in the Byward Market on Saturday, December 8th. This walk, led by rob mclennan, will showcase the poetry of this historic neighbourhood, including sites significant to Susan McMaster, Diana Brebner, Stephanie Bolster, William Hawkins, Neil Flowers, The Vanilla Reading Series and The Vogon Reading Series, WORDFEST 1983, John Bart Gerald and Capital Slam, among others. The walk will begin at 3:30PM outside of the National Gallery of Canada on Sussex Avenue. During the hour-long walk, participants will visit locations where they will hear about some of Ottawa’s contemporary poetry history, and hear from a special guest poet or two. Come prepared for rain or shine!